Building a site on USMCA.com has led to significantly more traffic. In October I wrote about creating a website for USMCA.com using GoDaddy WordPress hosting and the included Beaver Builder plugin. I thought I’d provide a bit of an update about how the site is performing. As background, USMCA is short for United States-Mexico-Canada Agreement, a new trade agreement that is designed to replace NAFTA. It still needs U.S. congressional approval. I bought USMCA.com the day the deal was announced in a buy now transaction. I parked it for a few days and received lots of purchase inquiries, but none that met my requirements. So I decided to see what happened if I developed the domain into a website. Could I attract significantly more eyeballs to the site than just the type-in traffic it received as a parked domain? The top of the chart is 2,000. 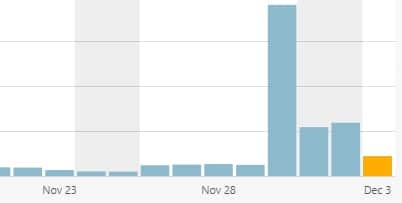 In a typical day the site gets roughly 100 pageviews but it spiked after USMCA was in the news again. I expect more spikes like this as it is debated in Congress. The traffic comes mostly from type-ins and search and mostly the latter. The search traffic is primarily from Bing and DuckDuckGo (which sometimes pulls from Bing). Most of the searches are for USMCA but there are also long tail searches and many for USMCA.com. My goal is still to sell the domain name to a group that can benefit from it, but developing the site has been an interesting exercise.